The following post contains SPOILERS for Venom. It is meant to be read after you’ve seen the film and you’re totally confused about what you just watched like we are. There are a lot of questions one can ask about Venom. Like “Why?” and “Uh no, but really: WHY?!?! ?” But let’s get more granular here. 1. Why Does Venom Still Look Like Spider-Man When Spider-Man Isn’t Involved In the Film In Any Way? 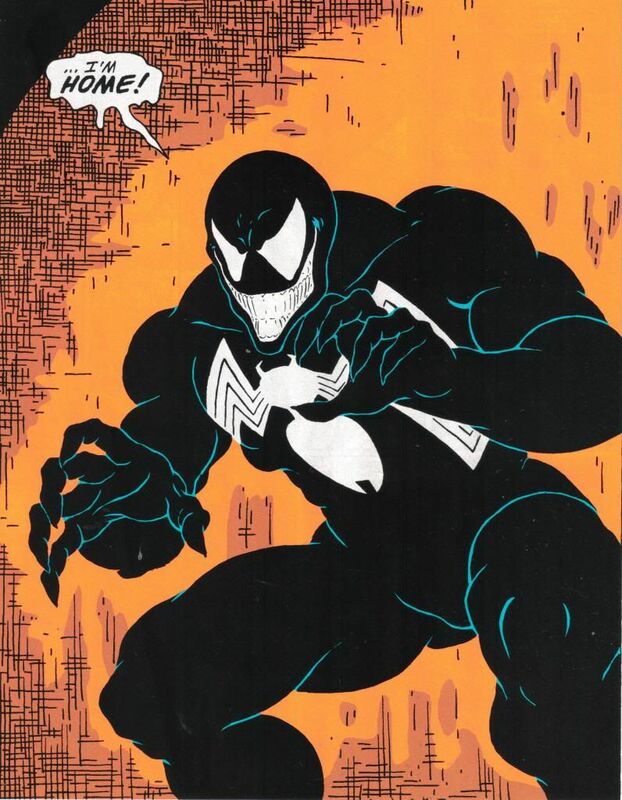 The whole look of Venom with the big, white eyes comes from Spider-Man. 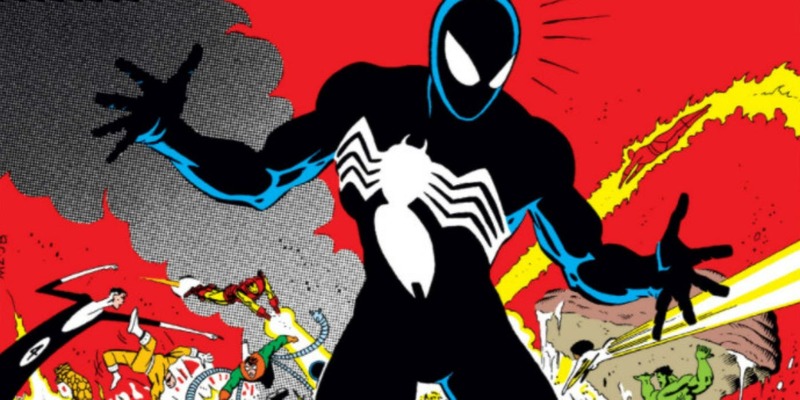 The comic-book Venom was first introduced as a replacement costume that Spidey acquired while he was off on an alien world. It looked sleek and powerful on Spider-Man, and then when he discarded the suit and it attached itself to Eddie Brock it simply exaggerated its features and added that crazy mouth and tongue. The Venom movie has nothing to do with Spider-Man. So why does it still look like Spider-Man (minus the big white spider logo on the chest)? Your guess is as good as mine. Maybe they’re big Homecoming fans back on the symbiotes’ home planet? 2. Why Is Carlton Drake Obsessed With Symbiotes? We eventually learn that everything Carlton Drake (Riz Ahmed) does in the film is an attempt to preserve humanity past whatever horrible fate awaits us after climate change destroys our planet. He found these symbiotes with a spaceship he sent out to explore the galaxy and he’s convinced they’re the key to humanity’s survival. But why? And why is he so intent on beginning human trials so quickly, when these symbiotes are obviously very hazardous? There’s absolutely no reason for him to be so personally invested in this alien goo, and so we are left with the only conclusion: He’s just an evil, evil dude and this is the weird way he decided to express it. 3. Why Does It Take a Symbiote 6 Months to Travel to the Malaysian Airport? While the main plot of the movie is going on with Eddie Brock over in San Francisco, there’s another symbiote wandering around in Malaysia, where the ship carrying the aliens crashed. The symbiote passes from an astronaut (John Jameson, a fun Marvel Comics easter egg) to a paramedic and then to an old women it finds in a Malaysian town. These first transactions look to have taken place over a matter of hours. Then there’s a “Six Months Later” card and when we see this Malaysian symbiote again it’s still attached to that old woman as it arrives at an airport. It took this super-powerful, all-knowing alien six freaking months to find its way to an airport? My grandmother could have gotten to LaGuardia in less time than that and she had such a bad sense of direction she never got a driver’s license because one time she got lost walking around the block. 4. Why Is Venom Obsessed With Tater Tots? 5. If Venom Needs to Eat Living Flesh to Survive, Why Does Tom Hardy Barely Ever Eat Anyone? The exact science of these symbiotes is very vague. Drake’s scientists claim that the symbiotes feed off their hosts, sucking them dry until they’re shriveled up and hollow inside like a Capri-Sun pouch. Then they move on to the next person. But Venom attaches itself to Eddie and makes a home there. At one point, his ex-girlfriend’s new man, a doctor, examines him and says he’s basically dying because of the “parasite” he’s contracted. Then a few scenes later, he’s fine again. And for all the talk about Venom’s violent tendencies, he barely kills — much less eats — anyone. The practical answer to this one question is “They had to cut out a lot of violence to avoid an R-rating.” But putting these last two questions together, maybe tater tots have some kind of preservative quality that’s good for symbiote digestion? 6. Why Doesn’t Carlton Drake Have Any Security Cameras? Eddie Brock gets stuck to Venom because a remorseful researcher at the Life Foundation (played by Jenny Slate) brings him to her laboratory to get evidence that proves Carlton Drake is a monster. The symbiote escapes from its cell, hides inside Tom Hardy, and together they escape the Life Foundation. Drake shows up and he’s pissed off. He yells stuff to the effect of “My symbiote’s gone! Someone broke in here! And I don’t know who took it!” Wait, you don’t? Yes, Drake spends several scenes trying to figure out who stole his symbiote, because apparently Drake — one of the richest men on earth, who runs the most advanced lab ever created, with a private army as his disposal — doesn’t have a single security camera in his entire office building. 7. If Riz Ahmed’s Character Is British, Where Is His Accent? This one is just baffling. They introduce Carlton Drake in an interview with Eddie Brock. He talks about his backstory, explains who he is, and how he became this big powerful rich weirdo. And he casually mentions that his parents are from England, then continues on with this expository monologue. Okay ... so? That’s the sort of line you drop when you have a British actor in an otherwise American film. And Riz Ahmed is British. But his character speaks with an American accent — and a pretty good one to boot. So why say that? I kept waiting for Hardy — who is also British and talking with a (less convincing) American accent — to reply “My parents were also from England!” He did not. 8. Why Do Drake’s Drones Spit Blue Flames When They Crash? It’s tough to pick just one worst scene in Venom (there’s a lot of competition for that prize) but it might be the big, ugly, awful chase scene through the streets of San Francisco, where a newly Venomized Eddie Brock drives his motorcycle through traffic while pursued by an army of Life Foundation drones. These drones swoop out of the sky and dive at his bike, and when he dodges, they crash into the pavement and explode, spewing huge blue flames everywhere. Do ... do drones do that? I don’t think they do that. 9. Why Does Carlton Drake Have a Spaceship Ready to Fly at the Drop of a Hat? After the Malaysian symbiote completes its six month journey to San Francisco and bonds with Drake, and after Venom sours all his other plans on Earth (that jerk), he decides it’s time to vamoose and return, Poochie-style, to his home planet. He starts barking orders at his minions about a spaceship launch and within seconds — literal seconds — there is a craft fueled and primed and ready to head out into space. If this is even remotely true, someone needs to check on Elon Musk. After the last couple weeks he’s had, he’s got to be eyeing of his launchpads right now. 10. Why Does the Symbiote Devour Some People And Do Absolutely Nothing to Others? We all are, Michelle Williams. We all are.